Friday October 27th 1899 I was busy with the work part of the forenoon and sewed all the afternoon on my green dress. Julia was sewing carpet rags. Saturday October 28th 1899 I got the butter ready this morning and went to town about ten oclock. I ate some dinner at Aunt Emmas and paid her interest. I came right home and sewed some more on my dress. I read in the evening. Sunday October 29th 1899 It was a pleasant day. We went up home and Will went over to Woolfs. Lee is not at all well, we came home in time to do the evening work. read in the evening Julia went home today. Monday October 30th 1899 I sewed all the time I could get from the work. I finished my green dress and got my black dress ready to wear tomorrow. a pleasant day. 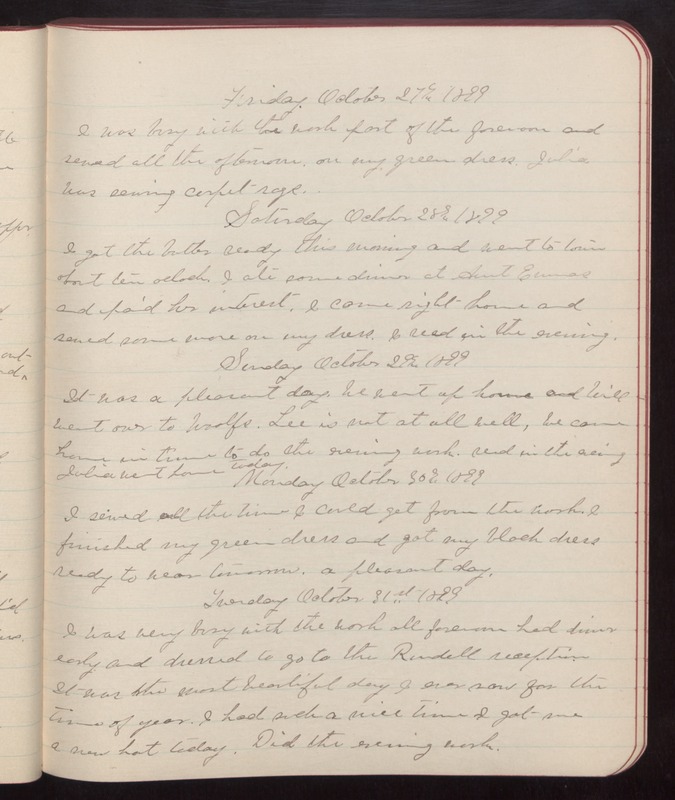 Tuesday October 31st 1899 I was very busy with the work all forenoon had dinner early and dressed to go to the Rundell reception It was the most beautiful day I ever saw for the time of year. I had such a nice time I got me a new hat today. Did the evening work.